Are you one of those people who check Facebook just one more time before going to sleep at night? Do you prefer to communicate with friends and family through Facebook rather than in person or by telephone? Are you often down in the dumps or dissatisfied with your life? Have you ever considered the possibility that these questions are related? Previous studies about the psychological results of Facebook use have found that using Facebook can increase jealousy, social tension, isolation, and depression. Only limited conclusions could be drawn from these studies, however. A recent study by researchers at the University of Michigan went further. The study’s creators tracked Facebook users for two weeks, to learn how their emotions changed. Five times a day, the researchers texted survey questions to the study participants. They queried the subjects’ emotional state and how worried or lonely they were feeling. They also asked about how much the subjects were using Facebook. The results were depressing; the more the participants used Facebook, the worse they felt. In addition, the Facebookers were asked about their satisfaction with life before the study began and after it ended. Again, excessive use of Facebook correlated with a decline in satisfaction with life. The researchers concluded that, although Facebook “provides an invaluable resource for fulfilling the basic human need for social connection,” overuse of the site can actually undercut human happiness. What does this study indicate for the half a billion or so people who go to Facebook every day? It’s probably too soon to tell, since social media is still a relatively new feature of the cyber landscape. It wouldn’t be a bad idea, though, to turn off your electronic gadgets more often and have a real-life conversation with another human being. Read the basics of the study here. The entire study, including descriptions of the methods, materials, procedures, and participants is available here. If you have resisted the lure of Facebook, this article will vindicate your decision. I thought it was interesting and I would like to hear more on this topic! Found your site on Google. This is a cool post. I’d like to see you take the main idea from this article and cretae another second article, and maybe you could embed a vid, also? I talk to my grandparents a long time ont the phone. I’d rather do that than communicate on Facebook; you get to hear the persons voice on the phone. Note the share button above. i like this article about facebook i think its true.! We don’t completely agree because facebook can make happy by seeing cute pictures even though it can sometimes upset you. I dislike it very much, do to the fact that it hurts alot of people emotionaly and physically!!!!!!!!!!!!! 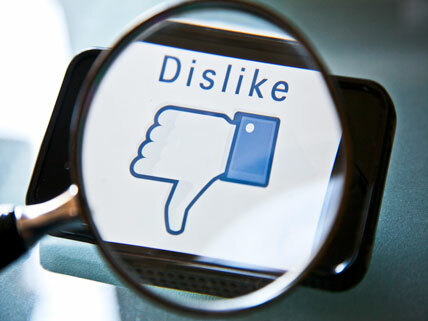 It’s okay that you don’t like what someone posted or if you dont like a pic they posted, then keep your commets and your dislikes to yourself…then Facebook will be a happy and fun website!Please Be Nice1!!! I believe this is true. Facebook does effect the life of people. There is a share button for Facebook above this.